Chassis and Dust Covers are fabricated out of lightweight 5052 H32 aluminum. The units feature a unique “box within a box” design that provides easy access to installed equipment. 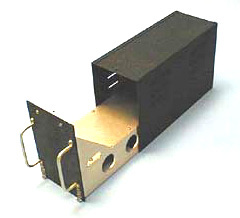 The Dust Cover includes top, side and rear cover with top/bottom ARINC-standard perforation pattern to accommodate convection or forced air cooling. The units can be fabricated to accommodate either ARINC 404A (1/4 thru 1 ATR) or ARINC 600 (2 MCU thru 12 MCU) sizes/configurations. The rear connector plate of the chassis mates with the dust cover with a 1/4 turn DZUS fastener for locking engagement. The units include a variety of rear connector configurations per ARINC 404/600. Churchill is often asked if standard enclosures can be modified to incorporate design changes made during preproduction… The answer is YES. Based on a library of 3-Solid CAD models and an enormous selection of tooling, we can make significant changes to the standard design.